Have you heard about the revival in South Carolina with Rick Joyner? As powerful as the Florida Revival with Todd Bentley in Lakeland, Florida, the Morningstar Revival is also under full steam. It is at Heritage International Ministries to be exact, and minister Steven Thompson is holding the fort down, but this, too is picking up steam. Revival is breaking out in the earth. Check out this video to see how God and the Holy Spirit are moving on the young people. 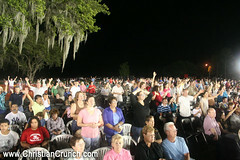 The new photos are in from the Florida Healing revivals. The night was amazing. There was a heavy spirit of holiness and worship. We entered an intense baptism of the holy spirit and baptism of fire, which was followed by a deep, intimate period of pure communion with the Lord. Get ready for the open-air meetings! You are currently browsing the archives for the outpouring category.